GP's - The Future is Rosy? Charles McKay takes a look at the future of the Grand Prix and uncovers some interesting facts and figures from the history of the series. This article was first published in 'The Voice', the quarterly magazine of the 'Friends of Speedway' organisation. Andy Davidson was the photographer for these pictures of this South Australian circuit. The former Hackney, Ipswich and King's Lynn promoter is the latest to nominate his all-time favourite seven. He includes some riders that he once signed for real, alongside some of his childhood heroes. The 'Blunsdon Bloggers' recently spent a week on a 'fact finding' mission over in Sweden and had a great time by the sounds of it. They were also joined for a day's work recently by Chris Seaward, sometime contributor to this site who's now gone on to bigger and better things. Catch up with all their latest escapades on The Blundson Blog. Robert Gray is looking for colour team pictures of the Halifax Dukes for the 1975, 1976, 1980 and 1984 seasons. These are for publication in a new book - Can You Help? Julia Bird is looking for video footage of the 1975 British Final - Can You Help? There's a new Yahoo Group dedicated to Old Time Speedway. You can read the messages on the website, or elect to receive them as emails. Poole's Jason Doyle has a new website. "Speedway was never invented it evolved from American Dirt Track racing! Australian speedway historians will be upset as yet again someone repeats the Hoskins Myth. The earliest race so far found around a trotting track was at the Old Agricultural Park Los Angeles 1901. Riding motorised bicycles around a trotting track is hardly speedway. The main feature of speedway is broadsiding the turns, could you broadside on a motorised bicycle? " "Dudley Jones story on Igor Plechanov mirrors my thoughts on a real oldtime great. The Russians were stupendous that night at the Firs. There were as many cheering and shouting for them as for Ove and the Stars such was the tension cranked up heat by heat. The result was of no consequence, after all it was only a challenge match. It was however ridden as if the very life of the teams depended on it. The only place I will differ to Dudleys story is when he says it was Norwich's best ever season, that was 1963 - a second place in the League and a National Trophy victory, and Ove in the World Final." "Can I just add my memories of Igor. I swapped badges with him, I exchanged the large 1965 West Ham badge for an even larger Russian medal, which I still have. I remember him and Phil Bishop discussing gearing for the large West Ham track, neither spoke the others language, but through the international sign language of the sport, we all understood the right gearing. Again at West Ham, seeing my Mum with her West Ham mascot and a mascot with a Russian race jacket side by side, he came straight over, a big smile on his face, and proudly pointed to his jacket and the mascot's jacket, and gave a big thumbs up sign. A man who will be sadly missed by the fans of 1960's Speedway." Dudley Jones pays tribute to the great Russian rider who sadly passed on recently. Amongst Dudley's recollections is the night that Norwich took on Russia. 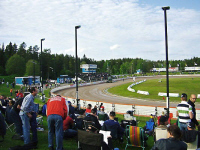 More track pictures from Charles McKay this week, this time of the Linkoping circuit in Sweden. This track is the home of the Filbyterna club. "There is a legend of a viking being the Ancestor of the Medieval kings of Sweden, the Folkungar. Folke Filbyter, the Viking himself came back from plundering and settled outside Linkoping. He was a sad guy going to the history remembered and named Filbyter cause he castrated horses by his teeth! Fil for Stallions you know.... and byter for bite! Unbelievable name of a speedway team don't you think!" Steve is now an armchair fan but used to follow Halifax and Bradford Dukes. There's a new unofficial website concentrating on the King's Lynn Stars - you can find it at kingslynnstars.e-fans.net. "I think a way in bringing speedway back to the public forefront, may be to try and get some events back onto terestrial television. By putting everything on Sky, it limits the viewing numbers and certainly restricts the enjoyment. If more people were exposed to the sport, then maybe more would want to attend meetings. It worked with me way back in the 19**'s....."
"Until the Promoters and others running Speedway admit that they don't understand the fans, the problems will continue to escalate. Unlike football, many of the spectators are like me, I attend meetings three or four times a week. Simply holding meetings on one day a week would actually cause the crowds to diminish. This week for example in eight days I would have seen Rye House at home three times (including conference league) and visited Poole and Arena Essex. Total cost including programmes £68.50. I would have had much enjoyment and entertainment, but unlike recent seasons I now actively pick my meetings, watching predominantly Rye House and then picking some attractive meetings. I envisage doing between 60-70 meetings this year as opposed to 80-90 in previous years. Before you say I am not typical, I agree this point to a degree but I do see the same old faces at many meetings. This is a direct contrast to Football supporters. I would only pay to see my beloved West Ham. I have no interest in general football. Now when comparing prices I saw 5 speedway meetings for £68.50 and on Saturday I will watch West Ham play for £49 including programme. To me speedway is good value but it is definitely getting more and more costly and the standard of the product, especially in the Elite League, is plunging. So far this season I have seen three GP's at Cardiff, Copenhagen and Prague. The cost of Cardiff in my opinion is spiralling out of control. BSI continue to claim the attendances increase year on year but I'm not too sure. It's a fantastic product but too expensive. Less so than Formula one I agree but then Silverstone could probably sell out twice over so they can charge what they like. As speedway fans ask yourself this...when was the last time Promoters asked you what you want? They are too busy inventing terms like 'Play the Joker'. Deciding what a great idea it is for a green helmet colour instead of white. Inventing the term 'aggregate point' instead of 'bonus point' and finally and most importantly allowing meetings such as Arena V Reading where there were more riders absent than actually at the meeting...Try selling that little beauty to new punters...Will they come back, of course not. we as fans need to make our voices heard before it's too late, and by the way BSPA - 'hand offs' the Premier league, it's doing ok thank you!" "I hope speedway does survive all this. I think the main problem is the cost of attending speedway and the poor facilities at some of the tracks for the average fan although the corporate fan is well catered for. I feel that the speedway tracks should be updated and have good outside seating where you can watch the racing in comfort and having a great view at the same time, that's probably why the Millenium Stadium has been so popular. I've been there and you just don't miss a thing, unlike going to some or perhaps all of the club tracks you just don't get this. I feel that the entertainmemt is there, but I feel the tracks need to be updated and brought up to the 21st century. Football had to do this for their survival, remember the Bradford fire, Heysel and Hillsborough stadium disasters. Fortunately speedway hasn't experienced those problems, but I remember going to football matches in the 1970's and 1980's and the grounds were run down and in a poor state, the shed end at Chelsea didn't used to have toilets. So I say, bring in some kind of tiered seating along the start/finish straight and the back straight and keep the pit bend terraces, this might help in bringing back the fans, and still charge £15 for Elite League speedway." "I have been a stock car fan for some 35 years (a sport not always popular with speedway fans I admit) but I wholeheartedly agree with the comments of N Woods. In the past sports such as speedway and Stock Car racing were supported by travelling armies of fans who would follow their teams/drivers to whichever venue they were racing. I did so myself thinking nothing of doing 2/3 meetings a week during the season and knew some speedway friends who would follow their team all over	the country. But sadly those days have long gone. Both sports have forgotten that they were primarily aimed at the working man and even in this so called classless society not everyone is earning the sort of income which allows unlimited money to be spent on admission and travel costs. Entry prices for Stock cars are also £15 and with petrol it now costs me £60 for two of us to go to what was always regarded by us as a local track (Coventry). I can no longer afford to do the 50 meetings a season I did some 15 years ago - and the Stock car world is, like Speedway, asking why crowds are declining! I guess we are all in the same boat as well as racing at some of the same stadiums!" The birth of speedway is always a topic that generates great debate. The sport has certainly been staged continuously since Johnnie Hoskins' meeting at West Maitland, though similar events were probably held elsewhere prior to that. Irish historian George P Kearns has found a mention of a speedway-like meeting in Dublin in 1902. He wonders if this was the first ever speedway meeting? He's also looking for information on Irish speedway for a short booklet he's preparing on the subject. Charles McKay has sent us a fine collection of track photographs from his recent travels. 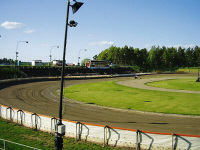 The first set of these are of the Vetlanda circuit in Sweden. Simon is a Swindon fan but doesn't confine his selection to those who have turned out for the Robins. He does however find a place for the current top-man at the Abbey Stadium. Sticking with Bradford, Robert Fisher is looking for a copy of "The Odsal Speedway Story" - Can You Help? Gary Done is looking for some Ellesmere Port away programmes from the seventies - he only needs six to complete his collection - Can You Help? Marcus Williams is trying to trace the history of a bike that's almost 70 years old. The fuel tank has been inscribed "Peamore Garage, Alphington, Exeter" - Can You Help? Cliff Jones from the marvellous Speedway Memories site has a gallery of pictures from Cardiff available to view here. "Brings back a lot of memories of both stockcars and speedway. All good ones though. I attended from 1965 through to late seventies." "Could I just point out that at no time has there ever been any talks about Peterborough 'seeing the season through'. Peterborough, like every league club has been hit hard by the number of postponents due to the weather causing an obvious cash flow problem for all clubs." "It's exciting to see the beginnings of speedway in Malaysia, and brings back memories of the rebirth of the sport in California four decades ago. 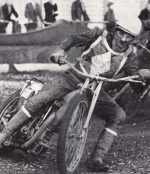 The demonstration races by Sam Taylor and Andrew Aldridge are reminiscent of the first visit to the U.S. by Ivan Mauger and Barry Briggs, who showed the American boys how it was really done, back in 1968. The Malaysian riders appear to have all the enthusiasm necessary, although what they are doing resembles American flat track more than speedway. But that's essentially what the American riders were doing in '68, until Ivan and Briggo taught them the proper technique. The main difference, however, was that the American lads were riding speedway bikes - an assortment of ancient JAPs, with a few Jawas thrown into the mix. I hope the Malaysians will soon adopt 500cc speedway machines and develop into a force in the speedway world, like their American counterparts did in the '80s and '90s." "I agree with the article. Chris Kerr, the American, of the Redcar Bears is one rider who always takes time out to meet with the fans after every race. He has taught other team members the importance of the fans. He has gone out of his way and gone to a few schools to meet with the young fans and talk about speedway. His fans love him for this and have nothing but kind words to say about him. Many fans aren't aware of what the riders go thru to make it in speedway. They aren't aware of the amount of money it takes to race. They don't realize the riders rely on outside sponsorship to make it in this sport. Without good equipment a rider will not make it, regardless of skills. So the more time they spend with the fans, more the fans will be made aware of the ups and downs of speedway." "I can't recall if I ever actually saw him race but from memory, was his nickname not 'Never say (Dai)'?" "Dai Evans rode for West Ham for a while in 1967. He was a mate of Ken Mckinlay." 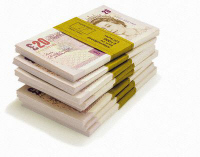 In recent weeks a number of people have left us feedback about the cost of watching a speedway meeting in 2007. Those comments we published provoked a reaction from other visitors, so we thought we'd collate these into a single article. This article features contributions from Dudley Jones, Ken Nicholson, Geoff Langley and N Woods. You can respond to the comments made, or share your own views, by using the feedback form at the bottom of the page. Over the last few years we've brought you extracts and reviews from/of some of the many speedway books that have been published. 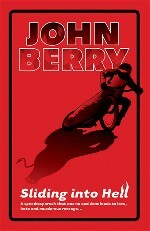 Only one of these was a novel, Sliding Into Hell by John Berry. An extract from the book appeared on the site, though it probably didn't create a very good impression of the book as it was from a middle chapter and totally out of context. The book has now been reduced in price, so we thought it deserved to be re-appraised. After a gap of several weeks, we welcome back 'Dream Team'. First up is Newcastle fan Bill Gibbs who selects his favourite Diamonds of the Sixties. He includes Brian Craven (left) in his selection and unsurprisingly finds room for a certain Kiwi favourite. 'Bring Back Cradley Speedway' is the aim of a new online petition - click here to find out more and add your own name. There's a new podcast available at speedwaypodcast.co.uk or to download from ITunes. In this edition the boys look back on the Czech Grand Prix and the World Cup. Well worth 30 minutes of anyone's time. The Canadian Speedway website has been given a makeover. There are pictures, profiles and videos of the Canadian riders and a very interesting overview of a speedway bike. The ever-helpful Robert Rogers, is now looking for some information himself on our Can You Help? page. 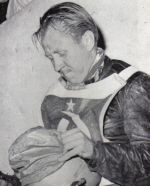 He'd like to know more about American riders Nick Nicolaides, Jimmy Gibbs, Don Hawley, Royal Carrol, Lloyd Campbell and Johnny Gibson who were part of the USA team that raced in a 1951 test series. Gary Tait wants to purchase a Berwick Bandits racejacket from either the 1994 or 1995 season. He's also looking for vintage footage of the Bandits in action - Can You Help? "Redcar are pretty good. The fans are allowed in the pits until it's time to warm up the bikes. Also quite often the riders walk back to the pits, shaking hands with crowd, after the meeting has finished. Chris Kerr can often be seen long after the meeting has closed, talking to the fans and having his photograph taken." "I well recall that the Firs in Norwich was an autograph hunters paradise. Most remembered incident was when a World Championship Round was rained off halfway through. On the Car Park, loading his gear, was Rune Sormander from Sweden. He stayed in the rain for half an hour signing for us kids before going to the changing rooms to get ready to leave the Stadium. The weather didn't bother us kids and Rune took it in his stride. All the Stars riders and visiting riders in the 50s used to speak to the supporters, both home and away. It was the done thing then. It has to be said that this doesn't answer the sports ills but it might just bring in a few extra people sometimes if they thought there was a chance of speaking to a rider as well as seeing him in action." Our competition, in conjunction with GPNetMedia.com and BHP Sport is now at an end and the three winners should receive their prizes shortly. Graham Cooke from the Swindon track staff has for several months been writing the 'Blunsdon Blog' detailing the track maintenance team's experiences. It gives a valuable insight into the efforts these volunteers make to allow the rest of us to enjoy our fix of speedway. Of course, the recent bad weather has made their job much harder, as we find out in this extract from the blog. The meeting was the Swindon v Belle Vue clash that was scheduled to take place on Thursday 26th July. These are our first ever set of Belgian track photographs and are courtesy of Clifford Cosher. Sadly, it seems that this particular track will not stage any meetings in 2007. The second auction for a Garry Stead model bike, with all proceeds going to Garry, is well underway on eBay. See the auction item and check out the latest bid price here. There are numerous other activites taking place in aid of Garry, including the opportunity to shadow the referee at Garry's benefit meeting later this month. See www.garrystead.com for full details. George Kearns who asked about Ernie Roccio on our 'Can You Help?' page wishes to thank all those who passed on information and photographs. He's also uncovered some very interesting information on early motorcycling activity in Dublin. More on that soon. There's a new blog dedicated to speedway in Malaysia. It's not quite speedway as we know it, but it's very close. The blog features some excellent videos and is definitely worth a visit. "Just a line to say I think your site is great and a very good read with all the comments and articles from the Speedway World keep up the good work. I support Oxford speedway and enjoy the new promoters new efforts to keep Oxford Speedway up and running seen some great racing so far this season the team is a young one and you have to praise their efforts its good to see." "What did speedway do to upset the press, they used to love us? The 1947 (Sunday) People Speedway Guide by Tom Morgan, known as 'Broadsider' in the trade was a very good booklet. Tommy Price in the late 40's England's first champion, a photo shows him proudly holding aloft the 'SUNDAY DISPATCH' World Championship Trophy. In the 1950s' Wembley used to think the London Cup was their own personal property as they won it so often, the Photo shows Bill Kitchen, Wembley captain holding the 'EVENING NEWS' London Cup. The point with this is that on the cups in bold letters is engraved the name of the newspaper sponsoring it and can be clearly seen even in photos over 50 years old. Coming up to the 1960's the Recorder Group of Newspaper sponsored the flying 1-lap record at West Ham as a second half event. (Sorry if most of my contributions to this site are from the stone-age, but I am an old fashion soul!). Coming a bit more up to date in the 1980's the Mirror (Daily & Sunday) produced Speedway annuals. Perhaps Speedway needs to think, paraphrasing an old saying, it is a case of 'Not what can the press do for us, it is what can we do for the Press'. "